Dave Donnelly accepts the Grammy award for best immersive album on Sunday, a win shared with Alan Parsons and PJ Olsson of Winter Park. 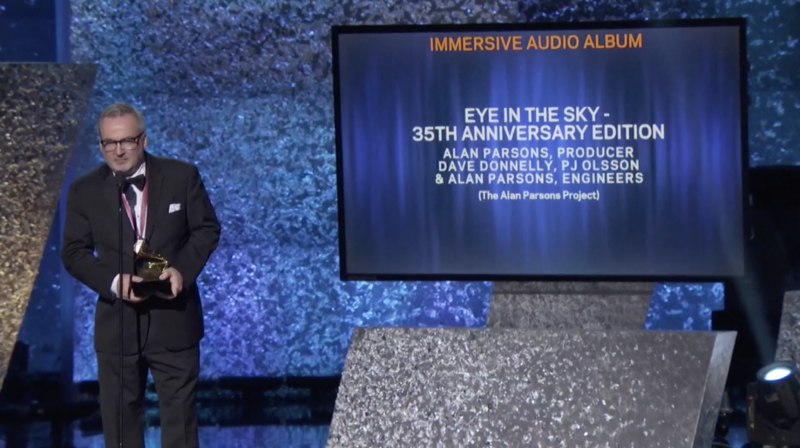 The Recording Academy awarded a Grammy award Sunday to Winter Park resident PJ Olsson’s latest collaboration, a remastered edition of the Alan Parsons Project album Eye in the Sky. The award was for best immersive audio album. Olsson’s win, shared with collaborators Alan Parsons and Dave Donnelly, was announced Sunday afternoon during the Grammy Awards Premiere Ceremony, which was hosted by Reggae musician Shaggy, honoring categories not announced during the live telecast held later in the evening. Donnelly accepted the award while Olsson and Parsons were not present at the ceremony. It was Parsons’s 13th nomination and first win for Eye in the Sky. It was Olsson’s first Grammy win.